Four Cases Where Modular Construction Is Your Best Bet! "Contractors remain quite concerned about labor shortages, tight margins, and growing costs." The Associated General Contractors of America (GCA) surveyed about 1,300 construction companies to find that 73 percent of contractors intend to add employees this year to meet projected demand. However, 76 percent believed that the labor market is likely to get worse this year, with a shortage of workers. The labor shortage has been a problem in recent years, and the construction industry needs to change. Modular construction is the solution for the construction industry skilled labor shortage. Constructing buildings via factory production is an ideal alternative for the sustainability-conscious builder by providing environments requiring a smaller workforce versus the average amount of workers required to complete a traditionally built structure. 1. Demanding Deadlines. In a National Institute of Building Sciences survey, 78 percent of respondents said that they found the speed to market is an advantage of the actual or realized benefits of prefab construction. Modular construction can be about 50 percent faster than traditional construction, making this method a reliable choice for projects with tight deadlines depending on the project scope of work. The Goddard Space Flight Center located in Greenbelt, Maryland is a national space flight laboratory that is involved in research, design and scientific innovation. For a new branch of the Hubble Space Telescope program, NASA required additional office space for the Hubble team’s 30 scientists and administrative staff. An old building on the site was demolished for a new modular building to be installed within a very tight deadline. After meeting numerous times to address the specific workspace needs of NASA officials, the Mobile Modular team completed the project in just 21 days. The plan included an eight-floor, state of the art modular building system, as well as a structure incorporating ‘clear span’ beams which crossed the building’s length and would provide work space for future expansion. The final product was a cutting edge, energy efficient building that exceeded expectations. -Building construction begins parallel with on-site foundation placement. This simultaneous process completes the project sooner than traditional construction methods. -Prefabricated buildings are based on replication. Materials are dispersed according to exact uses, so there is less material waste. -The factory setting enables energy efficient operations, reducing building expenses. Case Study - Mobile Modular delivers an affordable solution to accommodate 20 percent growth at Raul Yzaguirre School for Success The elementary section of Raul Yzaguirre School expected a 20 percent enrollment increase and required two double classrooms placed within limited available space. These new additions would have to be flexible for future expansion to enable the school to grow accordingly and avoid overspending the budget. 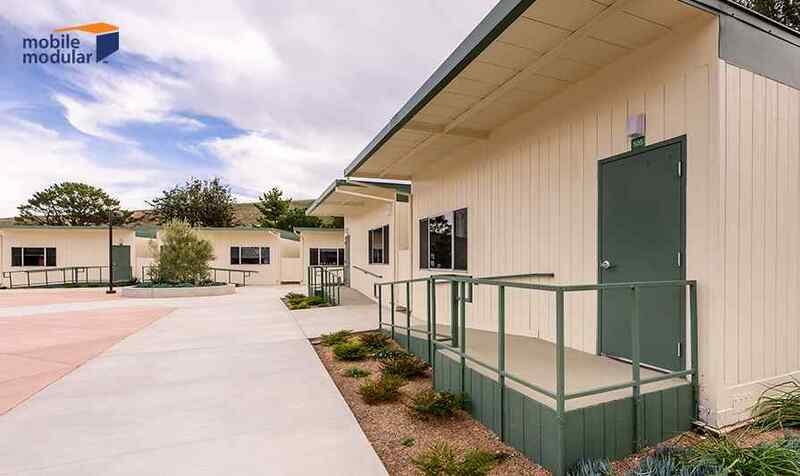 The Mobile Modular team suggested a standard 32' x 64' double classroom, which provided dual 24' x 32' classrooms divided by an interior partition. After completing the project in just four short days, the Raul Yzaguirre School for Success qualified for Mobile Modular’s new Charter Starter program. This program gave the school a $1,000 credit towards their lease and installation costs. Case Study – Mobile Modular delivers an on-time, under-budget modular office to the United States Army Medical Center staff. In a demanding renovation project, the U.S. Army’s Medical Center staff in Augusta, GA needed a mobile building as a fully functional medical facility and efficient general office space. Mobile Modular’s team created an energy efficient mobile building spanning 9,000 square feet to house medical facilities and the requisite office space. The workspace included 20 offices and a fully equipped gym to house approximately 20 doctors, 20 therapists, 20 nurses and 10 administrative personnel. The team delivered the facility on time and under budget, exceeding the stringent expectations of the U.S. Army by saving it a tremendous amount of time and resources. 3. Sustainability. According to the U.S. Environmental Protection Agency (EPA), buildings in the US account for 39 percent of energy use, 38 percent of carbon dioxide emissions, and 68 percent of total energy use. Green buildings are certainly a concern for future construction projects, and more and more organizations are choosing to go green with modular technology. When the Museum School couldn’t undertake a permanent construction project, they looked to Mobile Modular for temporary modular housing for over 11,000 square feet with the appearance, amenities, and construction quality that a permanent building would offer. Mobile Modular delivered a flexible floor plan that can adapt to changing future enrollment needs. Mobile Modular’s Campus Maker ModPods already use EPDM cool roofs (Ethylene Propylene Diene Monomers) and high-efficiency lighting as standard features. To enhance energy-efficiency, the design leveraged natural light and used energy efficient T-5 lights. Further high-efficiency HVAC’s and Bard CS2000 climate control monitoring platforms were integrated. 4. Flexibility in Construction. There is a growing need for adaptable buildings that can change from time to time to meet new requirements. The service life of a building not only depends on its quality, but also the range of its functionality. Flexibility is linked to sustainability: if a building can change to meet growing needs, that means there will be one less demolition site impacting the local environment. Case Study - Mobile Modular delivers a temporary campus during the renovation and modernization of Eastern High School, Washington, D.C.
Eastern High School needed a renovation for its 1930’s building located just blocks from the United States Capitol. The school administration wanted a safe, secure learning environment with efficient use of land and space, while maintaining a campus feel. The Mobile Modular team came up with a creative combination of modular buildings placed next to the existing school buildings in an open field and on the underutilized tennis courts. The CampusMaker ModPod, an eco-friendly modular classroom complex, was used to create 24 flexible classrooms that could hold up to 840 students. Mobile Modular has years of experience with modular construction and creating the best solutions for our customers’ unique needs. We have been providing commercial modular buildings for rent or sale to meet the specifications of a diverse array of businesses including schools, medical centers, clubhouses, and more. Our custom relocatable modular buildings come in a range of internal and external finishes, sizes, and configurations. We have experience delivering modular structures to satisfied customers in major industries including education, construction, healthcare, government, retail, industrial, and petrochemical. Request a quote today.